The winners of annual “TISK Corporate Social Responsibility Awards” organized by the Turkish Confederation of Employer Associations (TISK) were announced. Projects are evaluated based on comprehensiveness, efficiency, good practice, innovativeness and sustainability, and 9 companies received social responsibility project awards. 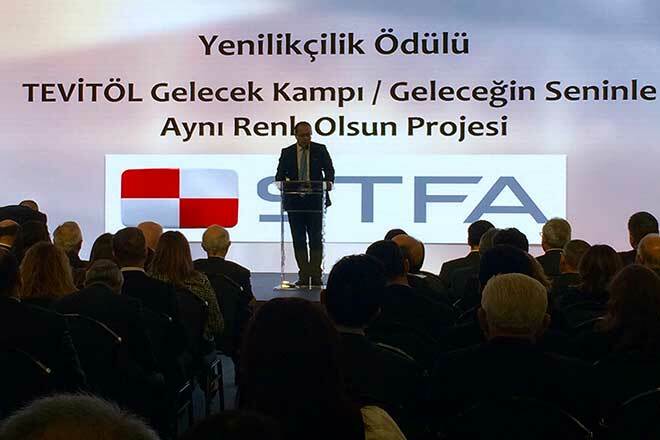 STFA’s Future Camp Project, launched with the goal of creating resources for TEVITOL (Turkish Education Foundation Inanç Türkeş Private High School) and focusing on education of gifted children, received the Most Innovative Corporate Social Responsibility Award. As a project that is designed to make sure that TEVITOL, our country’s prominent educational institution focusing on gifted children, can reach out to more number of gifted and impoverished children, TEVITOL Future Camp, out of 58 projects, received the Innovativeness Award since it involves collaboration with the leading Turkish companies. TEVITOL Future Camp, an project aiming to help students to get to know themselves better and to discover their tendencies, interests and professional abilities before choosing a university, was launched in summer under the leadership of STFA, and leading Turkish companies supported the project by making sure that their staff’s children benefit from this program.